One of the delights of losing a claim which has been dealt with in the county court under the small claims regime is that, if the winner was legally represented, you won't have to pay the legal costs they have incurred. There may be certain expenses you will have to be reimburse and for full details of them, the traps and how to handle a small claim, see my book Breaking Law. Is there any exception to this protection from a costs bill? Yes. You won't enjoy the protection if you have been guilty of unreasonable conduct. You might have deceived the court and the claimant into believing that you were defending the claim and then deliberately stayed away from the final hearing. Or you might have brought a hopeless claim and lied your head off when you got to court with some of the biggest whoppers the judge had ever heard. Whether the conduct was or was not unreasonable is going to depend on the circumstances of each individual case. But the Court of Appeal * has just endorsed some guidance on how the question of unreasonable conduct should be approached which will apply where you have attended the final hearing and not lied until your head dropped off. Conduct will not be unreasonable simply because you lose. And it will not be unreasonable if a more cautious litigant would have acted differently. The acid test is whether the conduct complained of can be reasonably explained. If it can, then your conduct (for example, in pursuing a failed claim or defence) might be regarded as optimistic but it will not be unreasonable. The Court of Appeal went on to express the view that it would be unfortunate if litigants were too easily deterred from bringing or defending a small claim by the risk of being held to have behaved unreasonably and so rendering themselves liable for heavy costs. In the case in question, the claimant had failed in a claim because of an obscure point of law which had gone against him. He then appealed to a circuit judge and failed again but the circuit judge ordered him to pay the legal costs of the defendant which had been represented by lawyers, on the basis that he had been guilty of unreasonable conduct in pursuing the appeal. The Court of Appeal decided otherwise and quashed the order for costs. It was especially influenced by the fact that the circuit judge had actually given the claimant the necessary permission to make the appeal. If you are making or pursuing a small claim and your opponent has lawyers, you may have heard from or you may be hearing from those lawyers to the effect that their client's legal costs amount to £40,000,000, accusing you of unreasonable conduct in the proceedings and threatening to ask the court to order you to pay those costs if, as they expect you do do, you lose. You might mention this latest Court of Appeal decision to them! "Stop that helicopter. I'm trying to sleep"
Whether its from the drummer in the flat above or the next door neighbour who drills into concrete as a hobby, noise can be a confounded nuisance. As it happens, the law formally calls it a nuisance where it really does interfere with you comfort but applying the standards of the average person. It you are unduly sensitive then that could be tough on you. Lots of things will be taken into account: in particular the type of neighbourhood. If you live in the heart of a large city, you cannot expect the same peace as someone who lives in the middle of nowhere. The fact that you came to the nuisance - it was going on before you arrived on the scene - will not prevent you being able to try and get the nuisance stopped or restricted or recover damages(or both). And if you live by an aerodrome and the noise comes from there? Then you are likely to have a problem. You cannot successfully bring a claim alleging noise nuisance caused by the flight of aircraft because whoever is responsible will have a defence to the claim under the Civil Aviation Act 1982. That's provided that the aircraft have been flying at a height which is reasonable having regard to wind, weather and all other circumstances. The lady in a case which has just been decided by the Court of Appeal * had a problem. She lived near an aerodrome and made a claim in which she complained of the noise generated by exercises carried out by helicopters on the part of the aerodrome which sloped towards the boundary of her property. The helicopters would land, take off, hover, turn through 180 degrees and land again. The exercises took place on the slope because part of the mandatory requirements for a helicopter pilot is landing and taking off from sloping ground. A High Court judge granted the lady an injunction which prohibited the exercises near her property. The judge concluded that the defence under the Civil Aviation Act was not available to the aerodrome for the reason that the exercises did not involve any flights. The aerodrome appealed. The Court of Appeal has quashed the injunction. There was no justification when considering the defence under the Civil Aviation Act for confining it to noise in the context of lateral travel from one fixed point to another. The helicopters had been in flight and the defence was available. So if you are thinking of moving, check first that the property in which you are interested isn't damp or haunted and that the sellers haven't covered over a nearby aerodrome with a blanket. "I Want My Ball Back." "Tough"
Police have visited a 73 year old woman from Bridlington, East Yorkshire who had kept footballs kicked over her fence by local children and damaged her plants. She was told she would otherwise face a charge of theft. Probably, nonsense! If a ball or some other chattel turns up uninvited on your land and damages your property, you are legally entitled to hold on to it until the owner of the chattel has paid you compensation for the damage. This is swingingly called - altogether now - the right of distress damage feasant. If its a tiger, elephant or some other animal that has paid the unwelcome visit, then special rules apply so check up on the law before locking it in the bathroom. Must go. I think I just glimpsed a rhinoceros eating my dahlias. My post yesterday may have left you in a tantilising state, not about the Waitrose car park at Richmond, Surrey but something which you might have found more interesting. To qualify for a free newspaper at Waitrose as a MyWaitrose card holder, could the minimum £10 spend include the cover price of the newspaper itself so if, say, I spent £8.60 on food and wanted a free Times which would sell at £1.40, was I entitled to it? Yes, yes, is the answer. See the Waitrose email below. I have passed your comments on to the branch for them to look into. I can also confirm that the price of the newspaper is included in the £10 spend. Thank you for taking the time to let us know about this. May your bonce be with you. You have previously met my email exchanges with Waitrose in my quest to see that right is done to customers. I regret it has been necessary to return to my Richmond, Surrey car park gripes. Here is my latest exchange. I'll let you know how things pan out - if you can wait. It's me again but no apologies. I have copied below my frustrating previous exchange of emails about shortcomings at your Richmond store. Two familiar matters. First, the never-right clock dispensing tickets at the car park entrance was yesterday five minutes slow. I have repeatedly attempted to explain to your company why a slow clock operates to the detriment of your customers. Why don't you get a new mechanical system? The present one is patently unfit for purpose. Alternatively, you could cease charging customers for use of the car park. If you can afford to give them a cup of coffee in consideration of the purchase of a single grape under your new free drink policy, you must be able to afford to sacrifice car park revenue. Secondly, I present a horrific image. Where and when has that precariously dangling piece of metal been photographed and by what irritant? 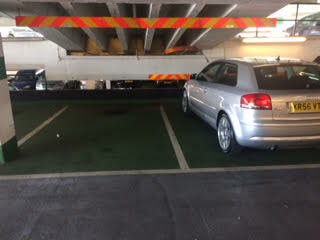 Why, at your notorious Richmond car park and yesterday - by yours truly. This mock up of an execution chamber is on the third floor of the park and what you see is the very same piece of metal as I photographed for you on 4 January 2017. I was led to believe shortly afterwards that management had arranged to deal with the dangerous state of affairs I demonstrated. Have they been stranded on the second floor? I shall be interested in your comments. Is anybody there? I have had no response to my last message. However, I can report that the car park entrance clock today was correct so that is a cause for genuine celebration. Congratulations. Alas, the execution chamber that is level 3 of the car park was today as dangerous as previously reported. Having inspected it further, I have concluded that its repair is within my competence although I cannot accept any liability to your company or any visitor to the car park should the strip of metal currently in a dangling stage thereafter become detached and damage property or kill or injure such visitor. Would it be convenient for the repair to be completed next Monday? I seek no remuneration. Don't you want to hear from me again? I am on alert for tomorrow. My offer will expire thereafter and may not be repeated until my Summer sale. I'm really sorry I had contacted the branch about this, and didn't realise I hadn't acknowledged your email. I hope you will accept my apologies. We will come back to you very shortly. Thanks again for your patience since you contacted us again. I've spoken with the manager of the branch. As this still hasn't been resolved for you since you first contacted us, the branch would be happy to give you a call to discuss this with you directly if you would find this helpful. I would be grateful if you could confirm whether this was ok, and if so what number they should call you on. May I suggest that the manager's time would be better employed in eliminating the danger rather than talking to me? Do you want me to effect the repair or will Waitrose deal with it? That’s all I ask you to tell me. I am concerned about the personal safety of your customers. Why isn’t Waitrose? I'm sorry this has caused you so much concern. I can assure you we do take the safety of our customers and Partners seriously and the metal you have mentioned has been reported. We will have our own team look into this shortly. With regards to the ticket machines you mentioned, these are checked daily and corrected if necessary. We are also hoping to replace these machines sometime in the future, but I'm afraid we can't confirm a date for this at the moment. If you have any concerns in future, I'd suggest asking to speak to the duty manager. Our branch Partners are always keen to resolve any issues for customers and it can help for them to be made aware of any problems at the time, so that they can take action there and then. They'll be happy to address your concerns and discuss with you what they could do to put things right for you. Thanks again for taking the time to tell me about this. I hope we'll see you again soon and that your future experiences are much more positive. I have visited the store today and see that the offending metal strip has been repaired and without me having to get out my tool box. So it wasn’t that difficult after all. On behalf of my bonce and the bonces of all your customers who patronise the car park,I should like to thank everyone at Waitrose for this feat. Unhappily, the two metal strips which, as you will see from my most recent photograph, should be hanging in the next bay are instead lying on top of the back wall of that bay. If the manager or other staff member who finally managed to get themselves up to the third floor of the car park could summon up the stamina and will to reach the third floor again, they will see the strips for themselves and might even consider arranging for them to be elevated to their correct position. In the meantime, you may feel it would be wise to notify your public liability insurers that the bay is open to customers despite the absence of all the warnings which should be displayed. It is kind of you to suggest that I should in future converse with the duty manager. The problem with this is that unless I disguise my appearance when I do so with a false moustache beard and raincoat, future shopping at the store could become an embarrassment for me. The other matter is that you would be denied hearing from me. That would be unfair on you, would it not? Just one last matter, For the purpose of qualifying for a free newspaper at Waitrose, is the price of the newspaper reckoned in the £10 required spend? Doing a neighbour a favour could be costly where you are a professional, the favour requires you to exercise your expertise and the neighbour is placing their trust in you. Take this case in which the Court of Appeal made its rulings last Friday. * A married couple owned a house in North London and wanted their garden landscaped. They had received a quote for around £175K so we aren't talking about messing around with a pond and some daisies. A good friend and American qualified architect came to their aid. She would act as an architect and project manager on the job and organise other landscapers for the couple. No charge! But and it was a big but - she intended to provide design work such as lighting and planting after the heavier work had been done. In the past, the couple had helped her out. The project turned sour. The couple became unhappy with the quality and progress of the work and the architect's involvement was brought to an end. The couple sued the architect for damages, claiming that she was responsible for some of the things that had gone wrong. The architect denied she was legally responsible for anything. A county court trial judge gave a judgment on preliminary legal issues in favour of the couple. The architect appealed to the Court of Appeal. The Court of Appeal decided that the architect did owe the couple a duty of care even though she was not being paid for the services which were under attack by the couple. If someone possesses a special skill and undertakes to apply that skill for the assistance of another person who relies on it, a legal duty of care to that other person will be established. It matters not that there is no contract as such between them. It is a situation that is akin to contact. If that someone was being paid, it would be a contract. Where the assistance is given in a social or informal way the result may be different. Here, however, there was a significant project being approached in a professional way and the architect did hope to receive payment for services later on. The case will now go back to the county court for it to decide on whether the architect breached her duty of care and,if so, what losses the couple suffered as a result and for which she would need to compensate them. Until tonight, then, when I'll see you down at the boozer at 8pm and I'll have a look through those court papers for you. No charge but you might want to buy my book Breaking Law! We should all make a lasting power of attorney. It gives authority to those we trust to make decisions about our property and affairs if and when we lose the mental capacity to do so ourselves. We can also make a separate power of attorney dealing with our personal welfare. The lasting power of attorney - which can be made on line - replaced the enduring power of attorney but any enduring powers of attorney made under previous legislation remain valid. A lasting power of attorney needs to be registered with the Public Guardian Office. An enduring power of attorney should also be registered where it is believed that the maker is or is becoming mentally incapable. The registration fee was reduced on 1 April 2017* - yes, at first I reckoned I had been April Fooled! - from £110 to £82. If you mess up the registration process, you will have to resubmit it at an additional fee and this has also been reduced, from £55 to £41. Where the person who has made the power of attorney is on certain state benefits or a low income, there may be a fee exemption of a 50% reduction. Go to www.gov.uk/lasting-power-of-attorney for much, much more and ease the worries of your loved ones. Cyclists as well as motorists are under a duty to take reasonable care on the roads (and to stop at red traffic lights!) which is pretty trite law. And it a duty that has recently been brought home in three civil claims by cyclists who had suffered serious injuries in road accidents. In one case, the cyclist lost the claim entirely: in the other two, the cyclist was held to have substantially contributed to the accident which means that their compensation will be reduced by the proportion of their own negligence. Case I* On the B5414, a single carriageway with one lane in each direction, at 8am on a dull day in January, the claimant was cycling alongside his friend: the claimant was on the outside. Just before reaching a puddle, the claimant veered to his offside onto the other lane as the defendant was driving his car on it in the opposite direction at a speed which was appropriate for the circumstances and road conditions. There was a collision between the claimant's cycle and the defendant's car. The trial judge decided that the claimant had had no good reason for moving to his offside. His friend had avoided the puddle without doing so. The defendant had been confronted at the last moment by the veering claimant. The argument that the defendant should have seen the claimant in time and either stopped or steered to his left was rejected. The claimant's appeal against the dismissal of his claim has been dismissed by the Court of Appeal. Case 2** The claimant was riding her cycle and the defendant, ahead of her, was driving his articulated HGV along Whitby Road, Ellesmere Port. They were both going in the same direction. Having driven over a railway bridge, the defendant stopped at traffic lights at the junction of Whitby Road with a road to his left into which he had intended to turn. He was signalling left but straddling two lanes. When the lights turned to green, he started to make that turn. At the same time, the claimant passed along the nearside of his vehicle and across its front. There was a collision. At the civil trial, the claimant was held to have been 30% to blame for the accident and the defendant 70%. The defendant's challenge to that decision has been thrown out by the Court of Appeal. In relation to the claimant, she should have realised the defendant was straddling two lanes and she could not have safely assumed he was going to go straight ahead or turn right. She had cycled down the brow of a hill on the railway bridge at some speed and had failed to heed the advice in rule 73 of the Highway Code ("Pay particular attention to long vehicles which need a lot of room to manoeuvre at corners. Be aware that drivers may not see you.....Do not be tempted to ride in the space between them and the kerb." Just before 7.30 am on a Sunday, the claimant was taking part in a cycling time trial on the westbound carriageway of the A27. The defendant in his van was travelling on the eastbound carriageway and went to turn right at a designated gap in the dual carriageway. He thought he was safe to make the turn. He was wrong. The claimant was coming along and he would be crossing the claimant's path. The claimant collided with the van's rear as it crossed and the collision caused him catastrophic and life changing spinal injuries. At his speed, it would have taken the defendant approximately four seconds to have moved across the carriageway. The claimant had been cycling at between 20 and 25mph. He would have been approximately 40 metres away when the van first started to move across the junction which would have given him ample opportunity to apply his brakes and avoid the collision if he had been keeping reasonable observation of the road. The claimant may have swerved within lane 1 but that action was too little, too late. The claimant, for one reason or another, had had not been keeping a sufficient lookout. Because of that, a High Court judge has ruled that he was 20% to blame. As we are about to enter a new tax year with bags of opportunities to fall out with Revenue & Customs, let us ponder how often they get it wrong. Call Judge Richard James. He was the presiding tax tribunal judge in a case called Dr Ragini Pandey v Commissioners for Her Majesty's Revenue & Customs  UKFTT 0216 (TC) whose reasons for allowing a challenge by the taxpayer have just been released. "Well, here we go again." That's how he started his judgment in the case which was factually complicated and the minutia of which I need not bore you with. This was not the first time a tribunal judge's judgment had started with these words. They were used by a judge in a 2015 case about tax credits after there had been a series of such cases marked by a catalogue of errors committed by Revenue & Customs. In this latest case concerning income tax, Revenue & Customs had messed up and were severely criticised by Judge James. The tribunal in the latest case cancelled a penalty which had been imposed by Revenue & Customs on a doctor which had omitted from the tax return required from her some of her earnings which had been subject to PAYE. The core ground for the cancellation was that the inaccuracies in the return did not amount to or lead to an understatement of the doctor's liability to pay tax. Without that, there could be no penalty as one of the conditions for imposing a penalty had not been met. You'll find chapter and verse in paragraph 1 to schedule 24 of the Finance Act 2007(available from Revenue & Customs and the waiting rooms of all good accountants' offices). One other thing. The successful doctor was late in putting in her appeal against the penalty. She had to ask the tribunal for an extension of time for doing so. Judge James indicated that the jurisdiction of the tribunal to grant more time for a late appeal was wider than Revenue & Customs say on the subject in their letters and guidance to taxpayers.